The Neanderthal genome included harmful mutations that made the hominids around 40% less reproductively fit than modern humans, according to estimates published in the latest issue of GENETICS. Non-African humans inherited some of this genetic burden when they interbred with Neanderthals, though much of it has been lost over time. The results suggest that these harmful gene variants continue to reduce the fitness of some populations today. The study also has implications for management of endangered species. “Whenever geneticists find a non-random arrangement like that, we look for the evolutionary forces that caused it,” says Harris. Harris and her colleague Rasmus Nielsen (University of California, Berkeley / University of Copenhagen) hypothesized that the force in question was natural selection. In small populations, like the Neanderthals’, natural selection is less effective and chance has an outsized influence. This allows weakly harmful mutations to persist, rather than being weeded out over the generations. But once such mutations are introduced back into a larger population, such as modern humans, they would be exposed to the surveillance of natural selection and eventually lost. The results suggest that Neanderthals carried many mutations with mild, but harmful effects. The combined effect of these weak mutations would have made Neanderthals at least 40% less fit than humans in evolutionary terms–that is, they were 40% less likely to reproduce and pass on their genes to the next generation. 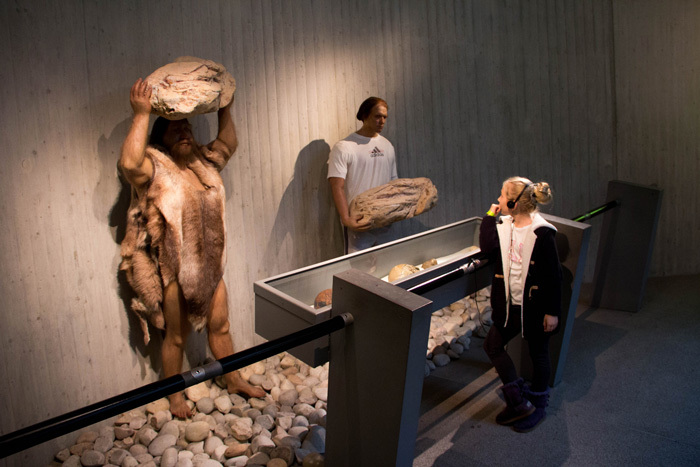 Harris and Nielsen’s simulations also suggest that humans and Neanderthals mixed much more freely than originally thought. Today, Neanderthal sequences make up approximately 2% of the genome in people from non-African populations. But Harris and Nielsen estimate that at the time of interbreeding, closer to 10% of the human migrants’ genome would have been Neanderthal. Because there were around ten times more humans than Neanderthals, this number is consistent with the two groups acting as as single population that interbred at random. Recent DNA evidence has confirmed that the Neanderthal contribution to Eurasian genomes was higher in the past. The results also have implications for conserving endangered species. Many vulnerable populations in fragmented habitats face similar genetic problems to the Neanderthals: inbreeding, low genetic diversity, and accumulation of harmful mutations. One management strategy for overcoming these problems is genetic rescue–improving the health of an inbred population by outcrossing it with other populations.